I feel funny writing a review on the Dynafit TLT Radical ST tech Alpine Touring Binding because I am such a total evangelist. I drank the Kool-Aid years ago and I’ve never looked back. 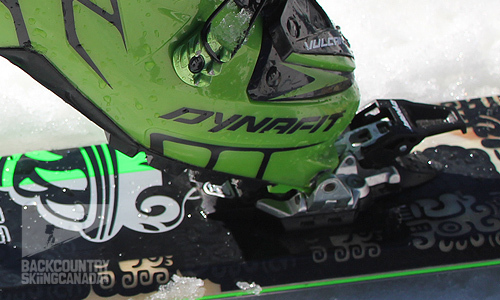 Dynafit is a German company known for its excellent light-weight, ski-touring-focused products. We’ve reviewed a whack of Dynafit gear on backcountryskiingcanada.com, including: the Dynafit Zzeus Alpine Touring Boot, the Dynafit Vulcan Alpine Touring Boot, the Dynafit Stoke Ski, and the Gear of the Year Winning Dynafit Eruption Down Jacket. We’ve also just recently completed a review of the Dynafit Huascaran skis and the Dynafit Speedskin climbing skins FYI. 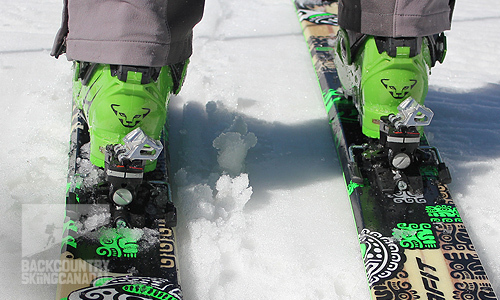 We’ve also put together some short “tips and tricks” videos on Dynafit bindings. 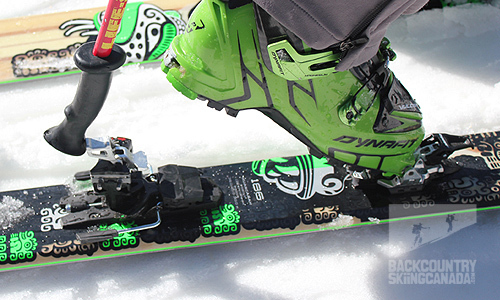 Look at: How to ensure you’re in your Dynafit bindings properly, and, the real crowd pleaser, crafty ways to lock your Dynafit bindings for touring mode. Last season, I skied on Radical STs bindings for about 20 days lift-service and 20 days in the backcountry. They never once failed in any way—they performed flawlessly while touring or at the hill. My “tester profile” may be of help in understanding why I am such a fan. I’m an expert but not an aggressive skier. I ski on mostly powder or packed powder here in the Kootenays and, if it’s an icy day, if ever, I don’t ski much. I weigh 175 lbs and the only drops I take are little ones. As is common practice, let’s let some pictures do the talking. 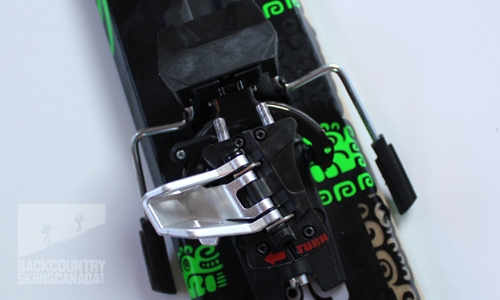 Dynafit TLT Radical ST Tech alpine touring bindings mounted on a pair of Dynafit Huascaran skis. A match made in heaven (or somewhere in Germany). Here’s a close-up of the Radical ST toe pieces. See the little pins that fit into the sides of tech compatible boots? 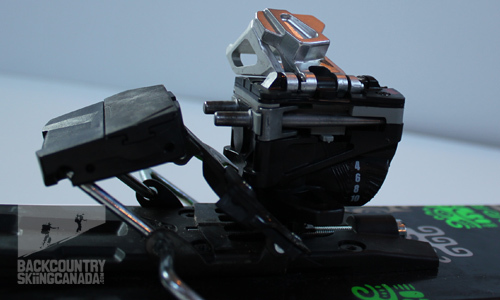 These are the pivot points which allow for the toe-only attachments and differentiate tech from heavier, chunkier frame bindings. Here, the boot is engaged in the toe piece. It’s ALL that attaches you in touring mode, and it’s all that you need. A side view of the heel piece in alpine mode, with the boot out of the picture. These forward pointing posts are what hold in the heel of your boot. 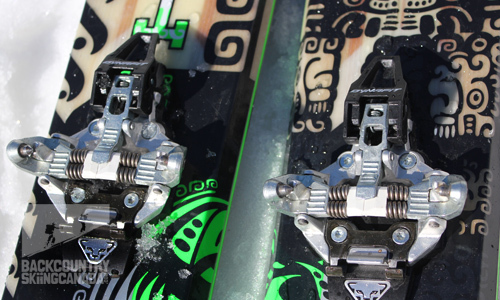 The silver, machined components on top are the climbing bail/heel-lifter things that replace the old volcano-style lifts on earlier Dynafit models. They offer two positions, in addition to the flat option, and are a breeze to operate. This is a top view to help orient you. 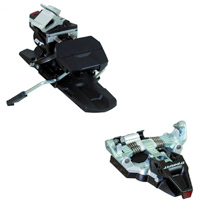 Note that the heel piece rotates clockwise to change from tour to alpine modes. This is different than with the older Vertical model but is easy to get comfortable with. Here, in this action shot, you can see how easy it is to engage the heel lifts—just a simple flip with a pole grip. Because it’s so easy, I find myself using the lifts more and saving more energy. Bueno. Radical ST binders from behind. They look weird, which is a plus in my books. We’re seeing more and more of these at Whitewater Ski Resort and I’ll bet at least half of the people we see ski touring are on some kind of tech binding; most of them Dynafit. 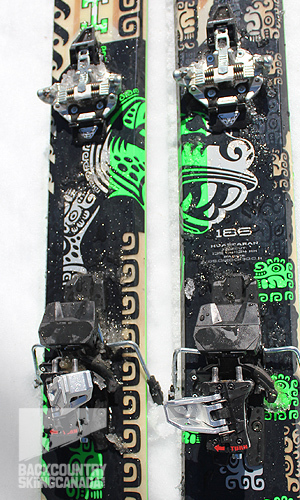 Unless you are a super-aggressive skier who is afraid of releasing, these bindings make total sense. It’s no wonder why virtually every ski guide and serious ski tourer uses them. I’ve been skiing on various Dynafit bindings for seven years and they have never given me a problem. Ever. I suggest you take them out for a tour one day and see just how different they are from a standard “frame” binding. Not only are they remarkably light and easy on the up, they also allow your skis to flex evenly across their length, rather than frame bindings which interrupt this desirable flex. They are up to two lbs less than a Marker Duke binding—on each foot. Over the course of a mile, that literally saves you the trouble of lifting about 4,500 lbs. Unreal. Lightweight, robust, intelligent design. They work fine on big skis. I originally had a pair of the beefier Radical FT for the Huascaran skis I have (114 underfoot) and I traded “down.” Lighter weight and plenty strong they are (as Yoda would say). They may take a little getting used to. Some people take a while to trust that the simple toe and heel interface are sufficient to hold them. It does…get over it. At 500-or-so beans, they ain’t cheap. Treat them with love and affection and they’ll last you a long time. Because Dynafit products are made in Europe, there are availability issues sometimes. Order early or buy them immediately if you see them.